Cooking with a crockpot is so convenient and the food is so comforting and warm that it is a favorite for the fall and winter. Here are some interesting historical crockpot facts, crockpot cooking tips, and a delicious recipe for crockpot pork rib kale soup. This soup is hearty and healthy! The idea of the crockpot was initially invented by Irving Naxon, who coined it the “Naxon Beanery All-purpose Cooker”. The invention was inspired by Naxon’s Jewish grandmother, who was unable to work in the kitchen during the Sabbath. She ensured a warm meal Saturday night by dropping off her stew at the bakery Friday night. The bakery’s oven wasn’t used during Sabbath, but it was still warm enough to keep the stew hot. In 1971, Nixon sold his business to Rival Manufacturing, who began selling the appliance under the Crock-Pot brand name. Slow cookers attained popularity in the US during the 1970’s, when women began to work outside their home, and still needed to cook dinner for their family. They could add everything into the pot before leaving for work, and have a fully cooked meal by the time they returned. Ever since then, slow cookers have been a staple is most US households. Refrain from filling the crock pot over 2/3 of the way full. The food won’t cook properly. If the crock pot is less than 1/2 full, the ingredients will cook too fast. Because fat tends to cook too fast, trim as much fat as possible before putting meat into the pot. Do NOT lift the pot’s lid. Add another 30 minutes each time the lid is lifted. Because food at the bottom of the pot cooks faster, put the veggies at the bottom since they don’t cook as quickly as meat. Spices loose flavor if cooked for too long. Thus, don’t keep spices in the crock pot longer than 2 hours. Add tender veggies, such as tomatoes and mushrooms, while there’s only an hour left of cooking. All seafood should only be slow cooked for an hour. Anything more will result in a rubbery texture. Spray inside of 3 to 4-quart slow cooker with cooking spray; set aside. Spray medium skillet with cooking spray. Heat over medium-high heat. Add pork; brown on all sides. Layer, in order, the carrot, pork, garlic, bay leaves, oregano, thyme, crushed red pepper, onion, chickpeas, kale and undrained tomatoes in slow cooker. Add chicken broth and water. Cover; cook on LOW 6 to 8 hours or until meat is tender. Remove pork, shred and stir back into soup. Remove and discard bay leaves. 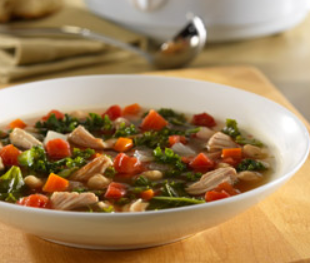 I hope you enjoy this tasty Crockpot Pork Rib Kale Soup. If you have extra soup leftover, here is how to freeze soup. You may also enjoy crockpot pork carnitas. What are your favorite things about cooking with a crockpot?